Four Corners bar and hotel in Belfast%u2019s Cathedral Quarter. Located centrally in the bustling Cathedral Quarter of Belfast. The main shopping precinct, sights and public transport are all within walking distance. 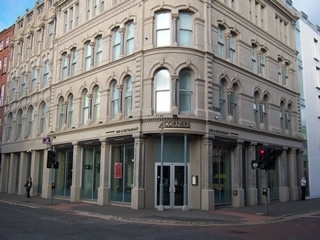 Contemporary surroundings and a relaxed atmosphere make for a great stay in Belfast. Have you got Google Earth on your computer? If so, then download the Google Earth view of Four Corners Bar. Is this the wrong position for Four Corners Bar? If you think so, then modify its position. Click / Tap the button above to get directions from where you are to Four Corners Bar. Lovely bar and restaurant in an ideal location in Belfast. Friendly staff and reasonablypriced food. Good menu and bar snacks reasonably priced. Going to make this our regular haunt instead of "grotty" Whig! Full marks all round! We called into the 4 corners on Thurs, 31/03/11 as it was my daughters 21st. We were just walking about and it looked nice. Well 10 out of 10 for the food and 10 out of 10 for the service. Exceptional, very friendly and a very relaxing atmosphere. I'm just sorry we didnt organise the party for there. We will become great customers.